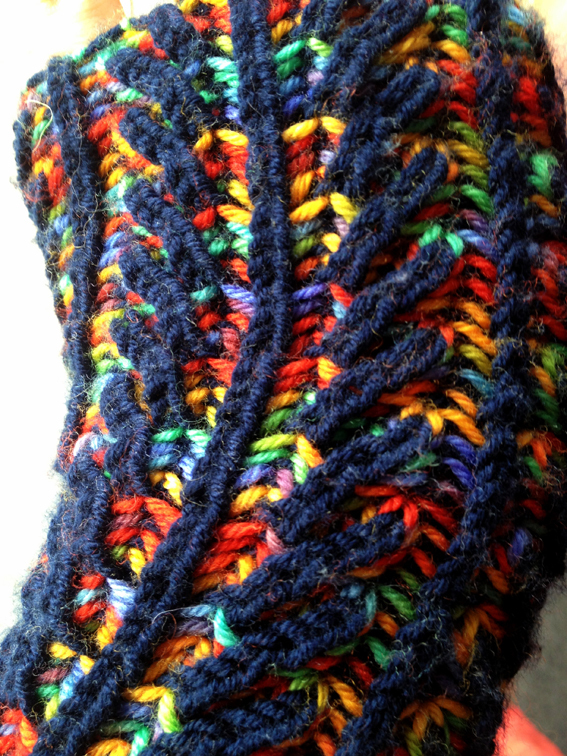 I often find that when I’ve got the itch to start a new project, knitting projects are somewhat easier for me to start. I think this is because I’ve got a pile of good knitting magazines full of patterns that somebody else has already gone to the trouble of testing, so I can start immediately. Especially when there are smaller items like gloves and hats and scarves that I can finish quickly and get an instant craft “hit”. It was in one of these “itchy” moments that I happened across a scarf pattern that I hadn’t noticed before (p44 of Vogue Knitting Winter 2010/11). Its essentially a panel of twisted brioche rib, with a hole so that the scarf can pass through itself, making a neat little bow at the neck. After a bit of practice to get my head around the stitch, I knitted this up in some lovely soft grey yarn for my mother who is currently swanning about France. That was back in March and she gets home in another fortnight, so I can document that one then! After mastering the stitch, I wanted to do something more. So I just started another panel, not knowing what I would do with it. 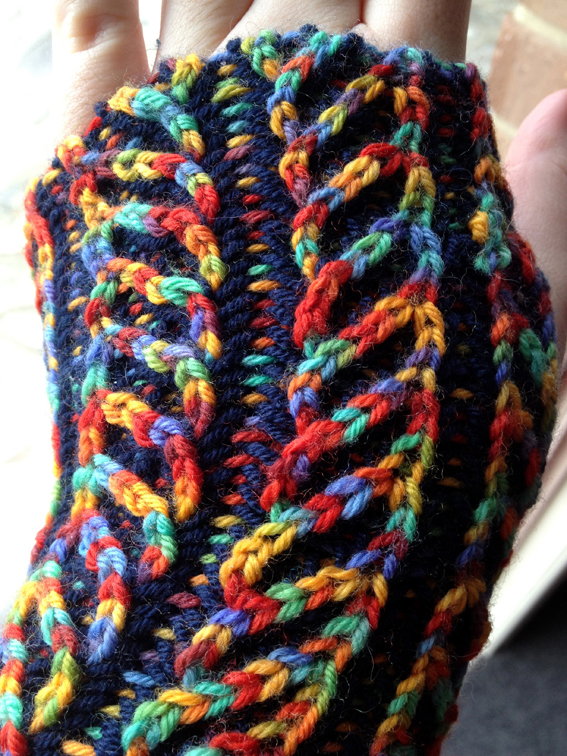 In the end I made two short panels to be the back of a pair of gauntlets or wrist warmers. I knitted two plain rib panels to be the undersides of the gauntlets and sewed the top and the bottom together, leaving a hole for the thumb. I made sure while stitching them together that I was doing a neat job because I was aware that both sides of the brioche knitting look nice, and the two colours had different effects on the front and back of the knitting. The blue is Debbie Bliss Baby Cashmerino. The rainbow is a Cleckheaton Merino Bambino 4ply that I’ve always loved; none of the colours look out of place in the mix.So now I have some lovely gauntlets to warm my hands while I knit! 05 Jun	This entry was published on June 5, 2012 at 1:50 pm. It’s filed under Projects and tagged Blue, Brioche stitch, Craft, Fashion, Gauntlets, Knit, Knitting, Merino, Navy, Rainbow, Wool, Wrist warmers. Bookmark the permalink. Follow any comments here with the RSS feed for this post. Newer: Puffed sleeves – the fuller the better! Its easy once you get the hang of it. I gave it a go, and you’re right! I am especially pleased that it included learning to hold wool in both English and German style at the same time, which became almost innate within about three rows.